2016 has a been a year of firsts. My first year out of high school has drawn to a close, and I have successfully completed my first year of university. I acquired my first weekend job and returned to Germany for the first time post my exchange in 2014. I kicked off my year by attending the Rotary Youth Leadership Award conference in early January. My local Rotary club kindly sponsored me to attend, an opportunity which I am extremely thankful for. I’m very grateful to have spent that week together with like-minded people, learning how we could better ourselves and become leaders in our communities. It was a special week during which I learnt many new things about myself and others. I began the school year full of ambition and excitement. I was officially a university student and looking forward to all the new opportunities it would bring. My first year was full of highs and lows, it wasn’t always an easy ride. I discovered that university requires a great amount of self-discipline, a skill which I am still trying to develop. Studying Japanese in addition to German has been a challenge which I underestimated at first. Meeting new people wasn’t easy, but next year I am determined to become more involved on campus. Despite everything, I’m grateful for the experiences I’ve had and what it has taught me. Right now, I’m feeling positive and looking forward to using what I have learnt this year to get more out of my second year at university and make it an even better experience. My highlight of 2016 was returning to my second home in Germany and being reunited with my German friends and host families. It was the first time I had returned to Flensburg since my exchange. I had purposefully timed my visit to coincide with my classmate’s Abiball, (formal celebrations) as they all graduated from high school. My year 12 formal dress received its second outing. Everything was so familiar, it really was as if I was returning back home. Enough time had passed that my friends and I had lots to catch up on, but it also wasn’t really that long since I had lived in Flensburg on my exchange. I enjoyed going sailing with my third host family on their little wooden boat and taking several day trips to Hamburg with friends. I joined in with my host mother’s evening sewing classes and went for evening walks around my beloved host city. I celebrated my 19th birthday abroad with a special birthday breakfast with my family in the morning and dinner with friends in the evening. My visit was especially important for reconnecting with the people which it had become hard to keep in contact with. I was very fortunate to have had the opportunity to return to Germany so soon after my exchange and would encourage every exchange student to do so. While my German language skills had lapsed slightly in the time that I had been back home, I’m even more determined to reach fluency and perhaps study abroad again on a university exchange. Four weeks flew by and before I knew it I was flying home to Canberra. Leaving Germany behind wasn’t any easier, perhaps even harder than last time. Except now I am certain that I will be returning again. 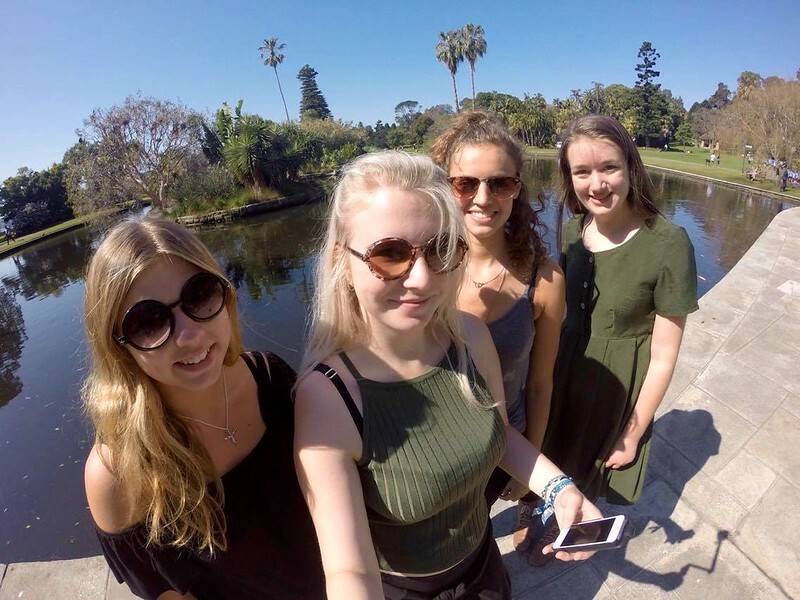 In September three of my friends from Flensburg travelled to Australia as part of their gap year. Though they couldn’t make it to Canberra to visit, I travelled up to Sydney for a couple of days to explore the city together. I wasn’t much of a tour guide because I don’t spend a lot of time in Sydney myself, but we managed to cover the main attractions. As usual I tried to keep up some sewing this year and managed to complete a few projects, despite university keeping me very occupied. Looking forward to 2017, I’m excited to announce that in January I will soon be embarking on my next adventure: a month-long language course in Kyoto, Japan. I will be participating in the Winter Japanese Program at Ritsumeikan University. While I’m not yet very confident in Japanese, I’m looking forward to the opportunity to become somewhat immersed in Japanese culture and building on my language skills. After all, they say the best place to learn a language is in-country, and I would have to agree. Once the program concludes, I’ll also be spending an additional week in Tokyo visiting a dear friend whom I met on exchange in Flensburg. Yet another example of the lifelong connections which are made through Rotary Youth Exchange. Stay tuned for more! Good on you Maddie. Enjoy Japan!